See more than 100 traditional and classic wooden boats of every type at the Annual WoodenBoat Show Friday through Sunday, June 22-24, 2018. The festival, which is hosted in partnership with WoodenBoat Publications, celebrates the design and craftsmanship of wooden craft. 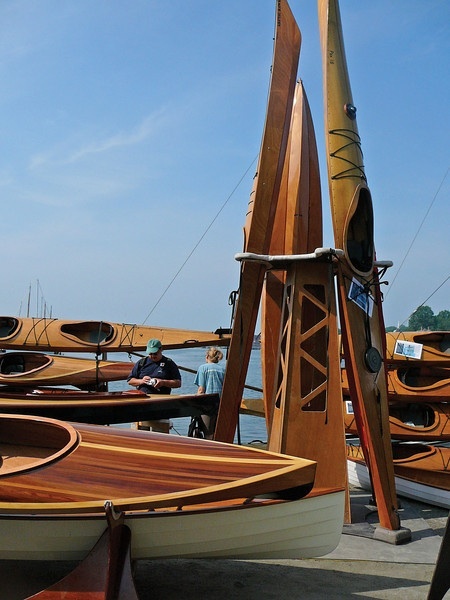 The three-day WoodenBoat Show offers something for all wooden boat enthusiasts and marine history buffs. Wooden boats of every type—large and small, old and new, power, sail, oar and paddle—will be on display, including cruising yachts, launches, runabouts, fishing boats, performance powerboats, daysailers, dinghies, rowboats, canoes, performance shells, multi-hulls and racing boats. Learn new skills at demonstrations and workshops throughout the weekend. Shop exhibitors’ booths and find everything you need to outfit your boat. Vendors will offer items for sale including maritime art, antiques, tools, books, nautical gear, and more. Those interested in the construction of smaller boats can stop by the Family BoatBuilding tent, where families and teams will work to build their own canoe or skiff during the weekend. Purchased kits are opened at 9 a.m. Friday morning and tools are put down around 3 p.m. Sunday, leaving, in most cases, a boat awaiting only final finish work. Some boats will be launched at the Show.